Picture the platonic ideal of a Thanksgiving table: a mammoth turkey stands center stage, surrounded with a smorgasbord of sides, with a plethora of pies and sweets waiting in the wings. Unfortunately, unless you're feeding a small army, this tableau is destined to linger past the holiday meal, in the form of leftovers and food waste. 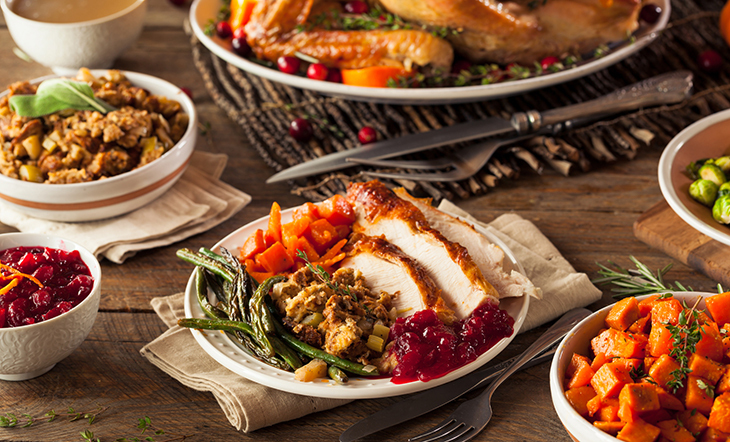 So how to tackle the Turkey Day challenge of overabundance? We tasked the chefs who contributed to our latest cookbook, Waste Not: How to Get the Most from Your Food, to come up with tips for handling scraps, bones, and leftovers, from the grocery store shop to lunch the day after the holiday. Read on for their ideas for making your Thanksgiving a little less wasteful, but just as delicious. My advice for waste management after Thanksgiving is one hour of planning before it. Before shopping lists are made and after recipes are collected, do some simple math on total pounds of food being prepared and divide it by the number of guests. You'll be shocked by the almost absurd ratio: four pounds of food per person is not realistic and is excessive. Plan on 16 ounces to 32 ounces of food per person for a proper feast. You can still consume the ridiculous 4,000 calories, but there will be less waste in the end. Plan your holiday menu around seasonal fruits and vegetables. And don’t be afraid to buy imperfect or "ugly" produce. They are as healthy and delicious as their pretty counterparts and both reduce food spoilage and help our family farmers. When it comes to holiday grocery shopping, we tend to buy more than we can use. Turn unused carrots, onions, broccoli, and cauliflower into quick pickles. Dry out fresh herbs for use in another recipe. Any unused pasta, quinoa, or potatoes are an easy add-in to soups and stews. A chimichurri made with equal parts cilantro, parsley, and carrot greens(picked from the stem so they're not too tough) is a great way to brighten up what's usually a pretty rich meal on Thanksgiving. The stems of parsley, sage, and mushrooms; onion peels and ends; carrot peelings; and celery scraps all can be saved in the freezer and added to turkey bones to make a stock for soups or stews after Thanksgiving. Leftover turkey makes a great hash or filling for tamales—or if you’re sick of the Thanksgiving flavors, add leftover turkey to kimchi stew. Leftover cranberry sauce can be rejiggered with ginger, garlic, and chiles to make a chutney for an Indian-inspired meal. Build a meal around leftover mashed potatoes by adding herbs, crumbled bacon, cheese, a little flour, and an egg. Form the mixture into patties and then fry them in butter or olive oil and serve with a fried egg on top. Leftover cranberry sauce can easily be turned into a dessert topping by adding fresh orange juice and lemon zest. Then just heat and pour over pound cake or vanilla ice cream. You can also store it in sanitized jars for use in your morning smoothie or as a spread on toast, waffles and pancakes. Perhaps the most basic (but most rewarding!) tip is to make stock with your turkey bones! Once you carve the turkey, just toss the carcass and scraps in a pot, cover with plenty of water, and let it simmer away while you eat. You can also add to the simmer as you finish parts of the meal: for example, any roasted veggies like carrots or onions or leftover herb stems can contribute to the broth—we even toss our leftover drumstick bones in there when we're done! You may not be in the mood for turkey soup the next day, but when you can use some of that stock to make a steaming bowl of turkey-broth ramen in midwinter (because it keeps for months in the freezer) you'll be both thankful and impressed by your foresight. Looking for some last-minute Thanksgiving inspiration? Check out our recipe roundup for this year's holiday. For more #WasteNot tips and recipes, click here. Maggie Borden is content manager at the James Beard Foundation. Find her on Instagram and Twitter.